Kim Kardashian isn't quite ready to forgive Tristan Thompson. 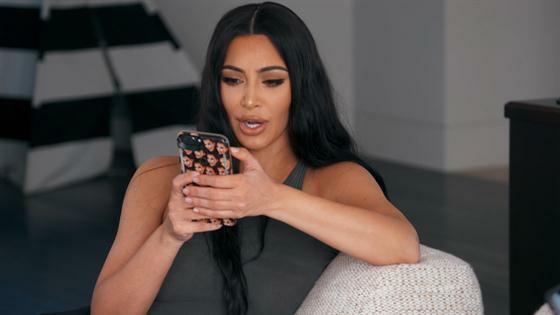 In this clip from Sunday's all-new Keeping Up With the Kardashians, the KKW Beauty boss reveals she has unfollowed Khloe Kardashian's boyfriend following his cheating scandal. "She's like, 'Please I don't want you guys to fight,'" the mother of three reveals to Kourtney Kardashian. "I'm like, 'I unfollowed him and I'm just letting you know.'" In order to further her point, Kanye West's wife declares she will not follow "any boyfriend or anything" because it's "so awkward" when she has to unfollow them. It appears the NBA star didn't take the social media snub well as Kim then notices that Tristan has blocked her online. "He blocked me! What a f--king loser," Kim retorts. "Literally, what a f--king loser." Unsurprisingly, North West's mom gives her sister a ring to get to the bottom of the Instagram drama. Clearly offended by the social media move, the 38-year-old declares "it's on." "Oh no! Please don't do the 'it's on,'" Khloe begs over the phone. "What does that mean?" "It just means when I see him, I'm going to spit on him," Keeks quips. "Whatever, I'll save it all for him. I won't stress you out." However, Khloe doesn't want to be kept in the dark as she needs to know "how long" to keep Kim and Tristan separated. While Kim promises she can "coexist" with Tristan, Khloe has her doubts. "Yeah, I don't think we can actually," the Kardashian-West matriarch concludes. Watch the awkward moment play out in the clip above!